Next stop on our trip took us to the South Carolina Aquarium. At the Aquarium, we were scheduled to meet Kelly Thorvalson, the Sea Turtle Rescue Program Coordinator and a Senior Biologist at the Aquarium. I met Kelly many years ago at a sea turtle workshop and we've stayed in touch ever since. Kelly's knowledge of sea turtle biology and rehabilitation is highly regarded and her passion for sea turtles is contagious. The photo on the right shows part of the Sea Turtle Rescue Center at the South Carolina Aquarium. Kate and I were fortunate to get the grand tour from Kelly. While all animal hospitals are kept clean and tidy, Kelly keeps one of the most organized hospitals I've had the pleasure of visiting. Tools of our trade are numerous and include scrub brushes, pool vacuums, suction hoses, pipes, nets and various other cleaning supplies. Kelly has organized her tools and equipment like no other. Kelly has all sorts of turtle enrichment in her tanks. This one pictured below was by far my favorite. In the wild we most often find sea turtles sleeping under ledges. If their whole bodies don't fit, they will slide their heads under something and fall asleep. We also see this behavior with the sea turtles in our Giant Ocean Tank. It never occurred to me to try a large pipe cuff like this one. You'll be seeing several of these in our turtle tanks soon! This was a great visit and we came away with a lot of creative ideas, which we plan to implement in our sea turtle clinic. Kelly's enthusiasm and passion for sea turtles was refreshing. I love being around people who truly love their work! 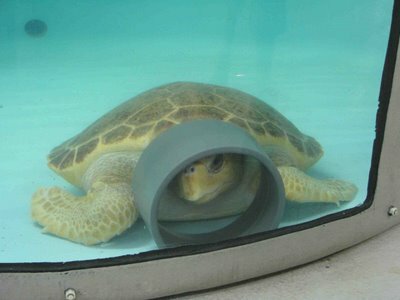 Kelly has a great website detailing her sea turtle rehabilitation work. Next stop on our trip will be at Zoo Atlanta. Giant panda's, gorilla's and elephants oh my! Thanks for blogging. It's cool to see the different approaches other aquariums have with husbandry. I'd like to read more about your progress. A Great Day for Hide and Seek! Sea Turtle or Dinosour of the Sea?